Consigned to Death by Jane K. Cleland, a Mysterious Review. Review: The hallmark of a successful author is to take a premise that's been done before, many times before, and make it seem fresh. 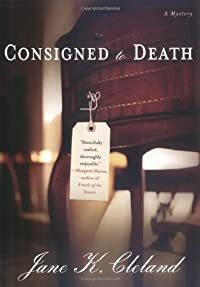 Jane K. Cleland has done just that with her debut mystery, Consigned to Death, featuring antiques dealer Josie Prescott. Cleland herself was once an antiques dealer, and her expertise in the field imparts an authentic quality to Consigned to Death. The descriptions of how items are appraised, valued, and even sold at auction are fascinating and are well integrated into the plot. Authors frequently try to accomplish too much with their first novel, but Cleland strikes just the right balance here. She provides a background story for Josie, but wisely doesn't dwell on it, allowing the reader the opportunity to learn more about her in future mysteries in this series. The adages of Josie's late father provide a moral compass for her, but with at least one being invoked every chapter, one wonders how long Cleland can keep using them without getting repetitive. Consigned to Death is an absorbing and impressive first mystery, and readers will no doubt look forward to spending more time with Josie in the future. Acknowledgment: Breakthrough Promotions provided an ARC of Consigned to Death for this review.